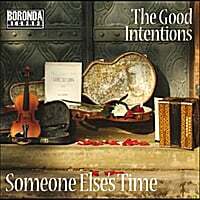 The Second album release by the Good Intentions, 'Someone else's Time' builds on the critical success of their first album, and delivers a second slice of their modern take on timeless American music. recorded in LA with producer Rick Shea, a well respected musician and song writer in his own right, and long time member of Dave Alvin's band of 'Guilty Men', the songs emphasize the harmony vocals of R Peter Davies and Gabrielle Monk, supported by Francesco Roskell, with session musicians such as Brantley Kearns on fiddle( Dwight Yoakam, Hazel Dickens) David Jackson on bass and accordion, ( John Denver, Emmylou Harris) and of course Rick Shea on mandolin ,pedal steel and Dobro. Initially recorded by Dave Raven who also played drums ( Dave Grohl, Keith Richards, )additional instrumentation and vocals were added in Liverpool and mastered by Paul duGre. the album also features guest vocal by Eric Brace.